Custodial managers, now more than ever, are relying on their distributors to keep their facilities safe and in compliance. Specifically, managers are looking to their distributor for training and education on how to identify the difference between sanitizing and disinfecting. "People tend to use the words sanitizing and disinfecting interchangeably," says Steve Rathbun, janitorial sales manager for Cedar Falls, Iowa-based Martin Brothers Distributing Co., Inc. "If you asked the typical person in a restaurant, they wouldn't know the difference between sanitizing and disinfecting, unless we tell them." In fact, there is a big difference. Sanitizing kills 99.9 percent of all organisms, whereas disinfecting kills 100 percent, says Rathbun. "Disinfectants and sanitizers both fall under federal regulations for pesticides, so you have to follow pesticide regulations when you are using those," he adds. "The typical restaurant owner doesn't know that." Custodial workers also need to know that sanitizers don't need to be rinsed on a food contact surface; disinfectants do. The surface has to be pre-cleaned before using a sanitizer; a disinfectant cleans and disinfects at the same time. Sanitizers need adequate dwell time to do their job, and then they need to air dry. What often gets overlooked, Rathbun says, is that a disinfectant must be rinsed with potable water after cleaning. "That's a big must," says Rathbun. "If you don't, to an inspector, that's just like taking a can of insecticide, spraying it on the table, and walking away." Using sanitizing and disinfecting products correctly will keep areas clean and companies in compliance. "If someone does get food poisoning and there is an outbreak, the first thing the inspectors look at is the cleaning products being used," says Leland Fishman, president of Petaluma, Calif.-based Fishman Supply Co.
Products and procedures for sanitizing and disinfecting, especially around food preparation areas, should meet the requirements for the task at hand. "Disinfectants should be registered by the Environmental Protection Agency and carry the proper kill claims," says Farmer. "And products used in foodservice should be purchased based on performance, not price. This should not be an area where departments try to save money." While there are myriad disinfecting products on the market, distributors say quaternary-based products are the most effective and widely used. "They give a full kill range on organisms, and they are less corrosive," says Rathbun. "While chlorine is most economical, there are certain surfaces, like fabrics, that you can't use bleach on. And bleach can be dangerous if you mix it with raw chemicals. So the quaternary-based products are safe overall and still economical." Most stainless steel cleaners, a staple in the foodservice cleaning arsenal, are petroleum-based and will need to be rinsed thoroughly with potable water. "There are some soy mineral oil-based products that are claiming they don't need to be rinsed, and that makes the job a little easier," says Rathbun. Surfaces that hold food, such as preparation boards and tables where people sit to eat, should be wiped with clean cloths. "A table shouldn't be cleaned with a damp rag that is used over and over," says Farmer. 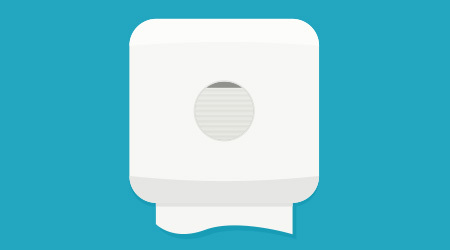 "Best practices dictate that a sanitizer be used, along with either a microfiber or disposable cloth. Carrying germs from one area to another on a dirty rag is a major cause of cross-contamination." If possible, gloves should be worn by the people preparing food and by the person clearing and cleaning the tables. This provides additional protection to foodservice workers and to eating patrons. Kitchens in most restaurants, hospitals, schools and business cafeterias are sophisticated, high-tech environments. Still, they need to be cleaned with an attention to mopping and scrubbing detail. To get to that level of clean, many custodial departments are turning to the use of specialty machines to get the job done. "There are more tile floors in kitchens, which are difficult to keep clean," says Rathbun. "They are generally mopped, but mopping doesn't clean the floor very well. So we're starting to see more people go towards specialty equipment, which will get grease off the floor better." To prevent cross-contamination, and keep things more organized, the jan/san industry now offers a multitude of color-coded products and chemicals. For instance, if the produce section of a grocery store is deemed green, all the cutting boards, brushes, mops and brooms should be color-coded green, as well. "Then we can take the next step and color-code the chemicals [with labels]," says Tom Dougherty, healthcare and janitorial sales manager for Philadelphia-based Penn Jersey Paper. "Then we're not using bleach where we shouldn't be using bleach." CYNTHIA KINCAID is a freelance writer based in Columbus, Ohio. For information on how to train employees on proper disinfecting and sanitizing techniques, click here.